DHAKA, Bangladesh – Pope Francis urged Bangladeshi priests and nuns to resist the “terrorism of gossip” that can tear religious communities apart, delivering one of his trademark, zinger-filled spontaneous speeches to the country’s Catholic leadership at the close Saturday of an otherwise tense and diplomatically fraught Asian tour. As he has done in similar encounters, Francis told the priests and nuns gathered in Chittagong’s Holy Rosary Church on Saturday that he was ditching the eight-page speech that he had prepared and would instead speak to them from his heart. “I don’t know if it will be better or worse, but I promise it will be less boring,” he quipped. And then for the next 15 minutes, Francis had the crowd in stitches, mixing paternal advice on how to tend to religious vocations (“with tenderness”) with gentle warnings about the havoc that gossip “bombs” can wreak when lobbed in closed religious life. History’s first Jesuit pope has frequently lamented the damage gossip can do within the church, where vows of obedience, strict hierarchies and closed communities can breed jealousies and resentment. The Bangladeshi edition was far more jovial in tone, and many in the pews nodded along as Francis made one zinger after another to make his point. It was a humor-filled end to a tense diplomatic trip that saw Francis maintain public silence over the Rohingya refugee crisis while in Myanmar, only to address it head on in Bangladesh with an emotional encounter with refugees themselves. “The presence of God today is also called ‘Rohingya,’ ” he told a group of 16 refugees who traveled to Dhaka from Cox’s Bazar, the district bordering Myanmar where refugee camps are overflowing with more than 620,000 Rohingya who have fled what the U.N. says is a campaign of ethnic cleansing by Myanmar’s military. 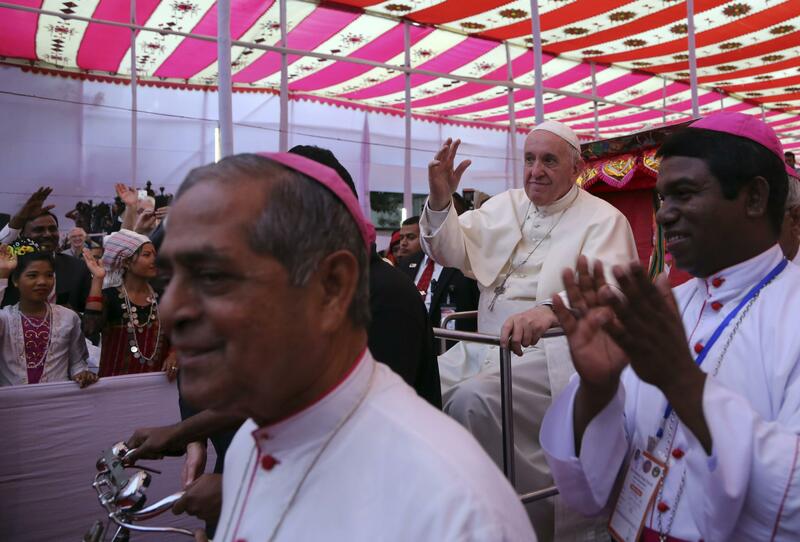 Francis’ final event in Bangladesh was a youth rally before boarding the plane for the flight home to Rome and his traditional airborne press conference. Published: Dec. 1, 2017, 11:49 p.m.